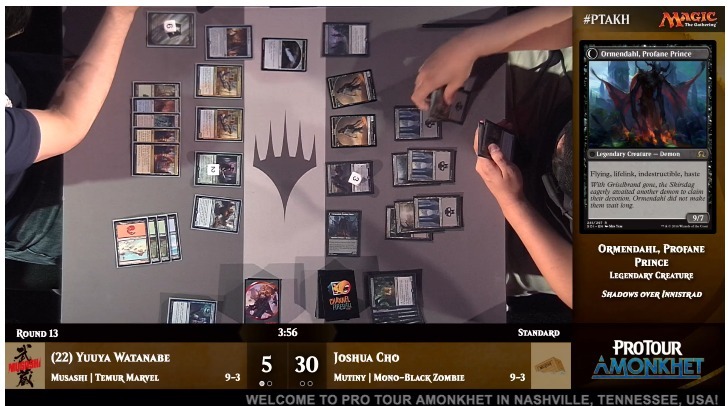 Here on MTGPrice.com we are providing MTGFinance coverage of Pro Tour Amonkhet all weekend long. 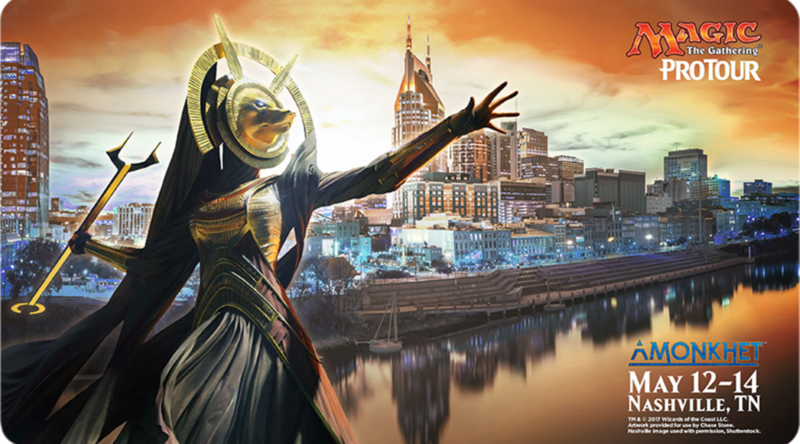 You can check out our Pro Tour Amonkhet financial preview over here, and our Day 1 round up over here. Today, join us for round to round coverage in live blog style below all day. Look for color coded text if you don’t have time for the whole thing. As we can see, the hoped for narrative of Mardu Vehicles no longer being the dominant deck type was in question based on the number of pros that decided to bring the best deck so far of 2017 into a fresh meta. That being said, it’s unclear thus far how many of the Mardu decks have survived Day 1 and are hovering around the top tables. That being said, my quick tally of the decks I think were at the top tables heading into the Day 2 draft, there seemed to be a lot of Temur Aetherworks Marvel decks in contention. Marvel has made a move from $6 to $10 so far, and could go higher if it proves out to be a major force heading into the Top 8. Other decks I expect to have a shot include UR Control, Mono Black and BW Zombies and a few Mardu Vehicles. We’ll know more around 4pm when the Standard rounds start. Overnight, the spikes included New Perspectives pushing to $4 from $1, which it may have trouble holding given the relative lack of pilots deep in Day 2. Liliana’s Mastery, one of my picks for this week on MTGFastFinance moved from $1 to $3 on a strong zombies performance across the tournament and should be able to hold a price point in that range. Aetherworks Marvel has moved from $6 to $10 and could push higher if it proves out as the top deck of the tourney. Reid has a few spicy cards in his build, including Liliana, Death’s Majesty, Yahenni, Undying Partisan and Demon of the Dark Schemes. In Game 1 Duke dumps Ulamog into his yard with Liliana and follows up by zombifying the giant Eldrazi. Hatto has nothing and we’re on to Game 2. Hatto gets out with an early advantage on his next try, with Aethersphere Harvester, Bristling Hydra, Riskhar, Peema Renegade and Winding Constrictor providing solid pressure while Reid has an Ulamog stranded in hand. Duke does manage to stabilize at 14 life behind a wall of mid-range creatures, but can’t find an answer for the Harvester in the air. A Skysovereign, Consul Flagship soon joins the board, but Ulamog finally joins the board to clear the skies and soon after take the match. Fujita is on a pretty spicy WR aggro deck that seeks to leverage exert abilities on cards like Glory-Bound Initiate with Always Watching for maximum benefit and zero downside. In Game 1 the life linking white creature gets Fujita up over forty life by the mid-game before the camera switches back. Michael Majors called out for using four copies of Chandra Flamecaller as a way to combat aggro decks in his Temur Marvel build. He ends up tied a game a piece vs. Mardu Vehicles piloted by Lio Yuchen and it’s a long one. One Ulamog turns into another from Marvel and match goes to Majors, contributing to a dominant team position by Team Genesis. Reid describes it as a hybrid between Marvel and GB Delirium and notes that he elected to run just two copies of Ulamog, the Ceaseless Hunger to minimize his reliance on keeping it out of hand. Demon of Dark Schemes was highlighted as a card that can be a fantastic hit off of Marvel in the mid game against aggro decks. 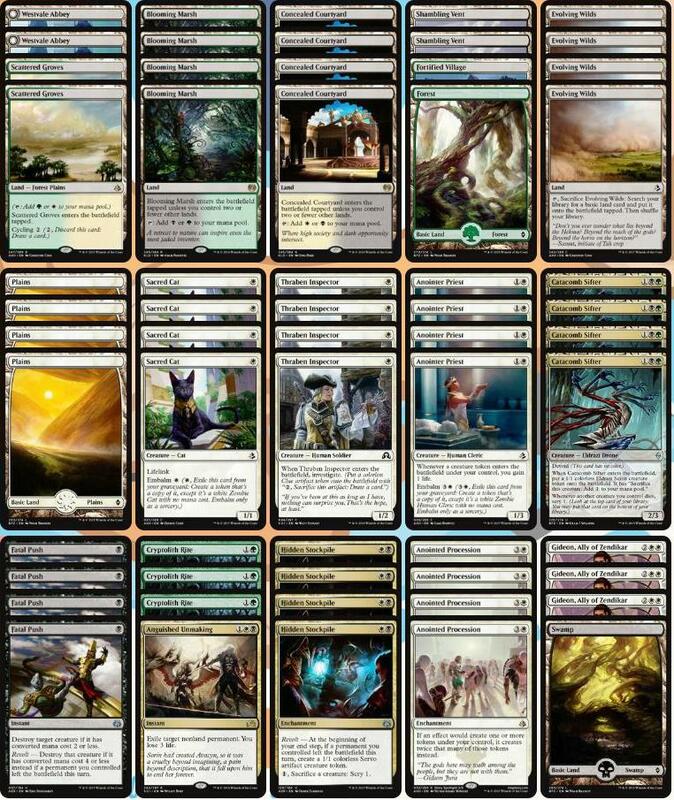 Fennell represents the best hope for a zombies deck to make the Top 8 so far with this mirror breaking WB build. In Game 1, Froelich gets off an early Marvel activation for an Ulamog, as we’ve seen all weekend and Fennell struggles to find an answer, falling down a game. In Game 2, Froelich takes a mulligan, stumbles on land and is facing down a full board by Turn 5. Game 3 looks much the same and Fennell goes to 12-1 and seems close to a lock for Top 8. Thanks to stats master Frank Karsten, we now have fantastic information about the Day 2 conversion rates of each of the major archtypes that may inform our financial decisions in the format moving forward. 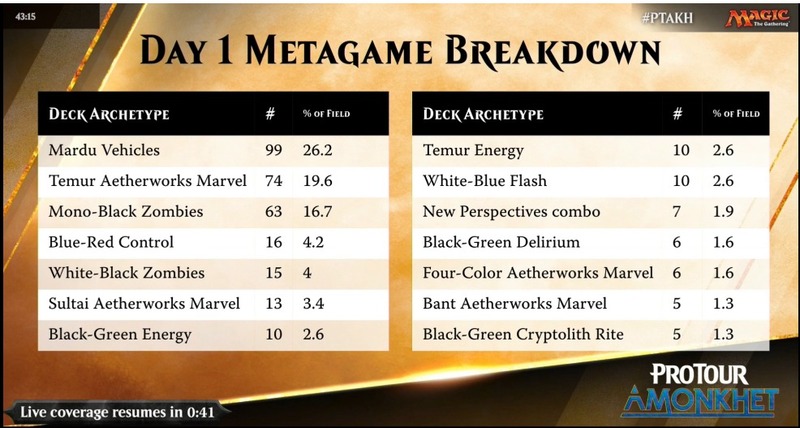 First off, the Marvel decks, which made up just under 20% of the field managed to put 71% of all related decks into Day 2, which is a very dominant position indeed. It’s worth noting that this was across six different variants of the deck, ALL of which put up at least 60% conversion except for the dismal 33% conversion of the six four color Marvel pilots. If Marvel gets a few copies into the Top 8 I’ll be very surprised if the card doesn’t bust past the current $8-10 price point on low supply. Anything less could indicate that Standard demand still hasn’t rebounded enough. The version running four copies of Chandra Flamecaller put an insane 100% of it’s pilots into Day 2, so that card is definitely worth keeping an eye on. Mardu Vehicles still put up positive results across all variants, but not quite as good as the Marvel decks. Note the blue sideboard splash leading to the best results, with five of six pilots on that build making Day 2. Interestingly the WB zombies decks did a little worse than the stock mono black builds, perhaps due to their slightly worse mana base. All told, these decks put 72% of their pilots into Day 2, and look almost as good as Marvel looking forward in the format. BG Decks, in a variety of configurations put up underwhelming results, with just 55% of their pilots making it into the second day. Digging deeper however we see that the BG Cryptolith Rite deck got all five of it’s pilots into Day 2, which could suggest that the deck was underrepresented vs. it’s potential, perhaps because many teams failed to find it. Look for Bontu, the Glorified and/or Vizier of the Menagerie to possibly show motion if the deck makes Top 8 or gets further camera time. So far Torrential Gearhulk based decks don’t seem to be where the format is headed, based on this mixed bag of results where only the two Dynavolt Tower pilots really made headway in the tournament. The card could be overpriced above $25 if this trend line continues. Another archetype that put up great numbers despite being underrepresented on camera was Temur Mid-Range, without Aetherworks Marvel. 82% conversion is fantastic, and this might be another dark horse worth considering in your local meta. 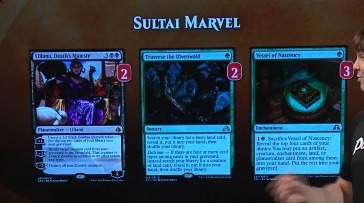 This match is more about putting Sultai Marvel on screen than representing top players with enough reach to Top 8. The players split the first two games. Jensen gets a Liliana, Death’s Majesty off a Marvel spin and brings back a zombified Ishkanah, Grafwidow to take the advantage. Jensen gets there and goes to 9-3-1. As we come into this match Hall of Famer Yuuya seems well positioned to take the match on time, and does so shortly to go to 10-3 and put himself in solid position to Top 8. This deck is getting featured because it’s pretty cool, but it only got three of seven pilots into Day 2 so its future is not yet assured and you should likely be selling your New Perspectives if you can. In Game 1, Calcano manages to Grasp of Darkness an early Servant of the Conduit from Muller, after Muller stumbles on land, and Game 1 slides into the Zombies pilots hands in short order as Westvale Abbey becomes a massive flying demon and takes down Muller. Game 2 gets pretty crazy, with early pressure from Calcano eventually met by a key Chandra Flamecaller, and after some jostling back and forth, Muller finds himself a Whirler Virtuoso with twenty-four energy on deck, resulting in eight (!) end of turn 1/1 flying Thopter tokens. With Calcano at thirteen and no easy way to deal with the air force Muller pushes the match to the final game. In Game 3, Muller keeps a zero land hand with two Attune the Aether and two Aetherworks Marvel. Calcano manages to fire off consecutive Transgress the Mind to ensure Muller can’t get rolling and thereby ensures his first Pro Tour Top 8, exiting the round at 12-2 and able to ID his way in. Off camera Gerry Thompson pushes to 11-3 on Black Zombies, with a solid shot to Top 8. This deck was notable for putting ALL of it’s pilots into Day 2. Bontu, the Glorified is the most notable opportunity here as a usual 3-of. Muller takes a quick Game 1 on the back of a quick spin. Game 2 is a drawn out affair, with Jensen on the back foot for most of the game. A late game Liliana, Death’s Majesty changes the equation a bit and several turns later Jensen manages to hard cast Ulamog and kill Marvel and Ulamog on Muller’s side. Chandra decides it again however and Muller is in at 12-3. Chris Fennell takes it in two to take top seed for Top 8 at 14-1. Duke has a slim chance at 11-4. Anointed Presence shenanigans are in full effect with this deck. Black reports that he gained dozens of life in the final game of his last match. Aside from Gideon, the rest of this deck is super cheap if you’re looking for a technical budget build. These two top pros are playing for potential access to the Top 8 here depending on their final tie-breakers. In Game 1 Duke is the first to get an Ulamog on the field, via his ace in the hole Liliana activation. Yuuya spins his own Marvel but can’t find what he needs and gives up first blood to Reid. Yuuya evens things up. In the final game, Yuuya finds a copy of Marvel facing down enough pressure to finish him off if he misses the spin. Finding a second Rogue Refiner to block Noxious Gearhulk, Watanabe stabilizes at five life and starts to pull away behind a wall of Negates in hand. Hall of Fame player Yuuya Watanabe looks locked for yet another Top 8. By my count, that gives us 4x Aetherworks Marvel, 2x Black Zombies, BG Energy and a single BW Zombies. With some of the Temur decks having access to Chandra Flamecaller, barring bad draws, I give the edge to the Marvel players tomorrow. This is yet another star-studded Top 8 at Pro Tour Amonkhet with multiple prior Top 8 competitors and two Hall of Fame members in Yuuya and Froelich. I haven’t noted any major spikes since yesterday, so people may be feeling cagey about rejoining the Standard fray so far. Let’s see how things play out tomorrow!